June & Mike Kent, UK Stayed in August 2017, our holiday at Villa Filip was brilliant. The location and privacy of this villa is perfect. The villa just keeps giving and has everything, and I mean everything you could need or ask for inside and out. All the essentials and more, the little extras that make all the difference, like extra towels, toilet roll, shampoo even a book to read etc. The owner is a real character, a lovely person and can’t do enough for you. There is ample, well thought of places to sit and chill out anytime of the day or night, including plenty of sun loungers round the pool and in the garden area at the rear of the villa. You even have a choice of three places to eat meals. The well-kept gardens are lovely and a treat in the evenings while the sun sets, is the beautiful scent from the Jasmine, unbelievable. The pool… is fabulous, especially with the heat of the August sun. The villa is well situated for site seeing, restaurants and the nightlife of Coral Bay. Most restaurants are a short drive away. Our favourite was the family run restaurant Anesi, just a couple of minutes down the road in the car. We always received a fabulous welcome from George the owner. The food is wonderful, and lots of it. The atmosphere is great and George always takes time to chat with customers; I think we were always one of the last to leave the restaurant. 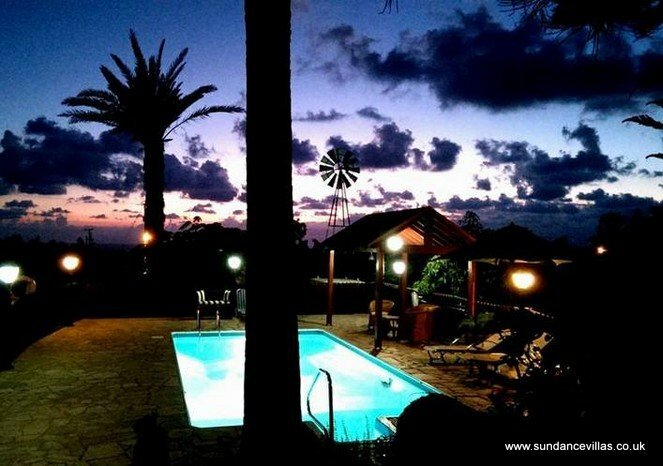 The villa really is ideally located to visit places on the west side of Cyprus. Whether it be going up to Polis and Latchi or down to Aphrodite’s rock. In August it is wise to choose when you visit places and how long it will take to visit. Especially places like the Archaeological site where the mosaics are as well as The Tombs of the Kings. Well worth a visit. We went to the mosaics site first thing when it opened to avoid the midday heat, and doing so there are few people about which makes it good for taking photos. Everything to see is outside in the sun and barely any shade. Take lots of water, freezing a water bottle is good - but it will melt very quickly, and wear comfortable shoes. As the site is near Paphos harbour it’s a welcome treat when you leave the site to see tavernas to have a well-deserved cool drink, and then take a walk along the harbour. There is so much to see on the west side of Cyprus, and we only got to visit some places. You’ll always find another thing to add to your list of places to visit. I have to add, this was our first year booking with Sundance Villa’s and Irene Hare is great. She thinks of so many things to help make your holiday a great one. The welcome hamper at the villa when we arrived at almost midnight was a welcome site and a relief to have because there wasn’t any shops open to get supplies. The information pack you get is full of information from where you can shop, restaurants, places to visit, villa information and not forgetting Nicole, the rep who contacts you when you arrive to help you in any way. Cy-Breeze car rental Irene will recommend to you… they are brilliant. Nick who runs it will help you choose and sort everything out for renting a car before your holiday. And when you arrive at the airport, quite literally, before you know it you are in your hired car and driving off. We had a fabulous time at Villa Fillip; this villa is great if you are looking for somewhere quiet, private and a place to relax and chill out. And don’t mind driving to get to places. Equally, you could be just as happy not leaving the villa as well. How could we possibly have thought we could go somewhere else next year!! This was our third year at Villa Filip and once again it brought the same magic as previously. Villa Filip is everything Sundance Villas claim and even more. Irene and her Team are always there to help and advise if needed but with such a character as Filippos you need look no further. His thoughtfulness, kindness and friendship are irreplaceable and make the holiday that more enjoyable. The information pack and recommendations from Sundance Villas from where to eat, shop, visit etc are a must to read because they are so helpful and accurate. Thank you once again Irene and Filippos for a wonderful holiday. This is the second visit to Villa Filip and once again was amazing. The Villa which is situated in Peyia, near to Coral Bay, is handy for all the local amenaties and Tavernas. Sundance Villas are probably one of the best to deal with, Irene and her team are very helpful no matter what the occasion is. Filip himself is so easy to deal with and any problem is dealt with immediately. Tavernas to eat at, which I highly recommend, are 'The Farm Yard' and 'Yiannis' in Kathikas, which is about a 20 minutes drive from Villa Filip and is between Coral Bay and Polis, the service and food is terrific. There is also an English food Taverna called 'The Welcome' which is on the road between the Vill and Coral Bay, the staff make you very welcome and the prices are quite reasonable. If your looking for a good Villa in a quiet location, then this one is highly recommended. I have just returned from a perfect spot for those seeking a bit of peace and quiet. Villa Filip is just off the main road on it's own private drive, and surrounded by banana and avocado orchards, with a totally private garden. You might here the odd person pruning the banana plants or picking the fruit, but apart from that the traffic noise usually goes un-notice. The villa is a perfect spot for touring the area around Coral Bay and St. Gergio up to Lara Bay. The villa and gardens are just as the pictures on the web site show and the owner Filip (Phillip) is a real character and is not intrusive in any way whilst only being a phone call away. I have tried other villas but in my opinion this would be hard to beat. What privacy! A complete contrast to our last villa holiday in Protaras, where we were overlooked from all angles. Most fantastic time at Villa Filip. It was home from home, we wanted for nothing. Hi Irene I can absolutely say we had a fantastic time - it was just what we needed and wouldn't hesitate to recommend the villa to anyone who is happy to have their own peace and tranquility on holiday. We took your recommendations to heart and all but one of the places we ate was on your list and all turned out to be fantastic for one reason or another - the one we didn't was the Sxxxxx Taverna in Agio Georgios which was dreadful and we only went there because we couldn't find the Sea Caves Taverna, which we did and enjoyed the following evening. We did a range of things from lunch at the top of the gorge for my birthday, to the Baths of Aphrodite Taverna and on the last day we travelled up to the Kannayiou Dam and then to lunch at Statios Ayios-Fotios, with the green roof - the best kebab we have ever had! Your list definitely made a difference to us being able to go out with confidence and enjoy our holiday experience in a country we had not visited before from day one - we would love to go back!